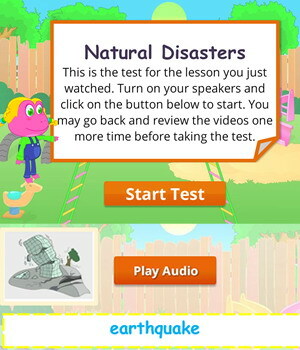 This lesson teaches English learners vocabulary about natural disasters. 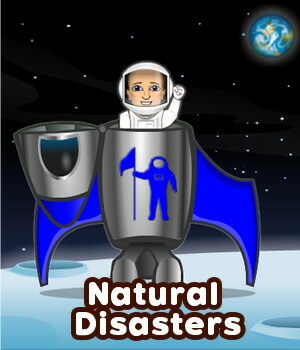 The lesson teaches ESL kids how to talk about disaster safety before, during and after. Its grammatical objective is to reinforce the use of the modal verb ‘should’ for giving advice. The lesson also teaches the use of ‘if clause’ and ‘main clause’ in zero conditional sentences. Zero conditionals are commonly used to talk about established facts or truths. This English lesson also reviews the use of the conjunction ‘because’, which is used when giving reasons. The worksheets below are useful for offline and classroom activities. 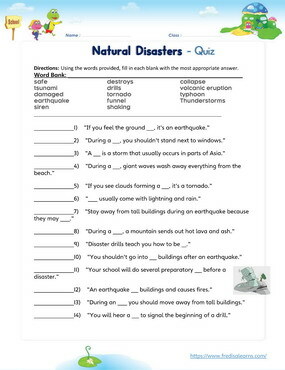 These printable exercises directly correlate with the above lesson 'Natural Disasters'. Every worksheet comes with an answer sheet on the second page for educators. Today at school, the teacher is leading a disaster drill to help students learn how to be safe during a tornado. 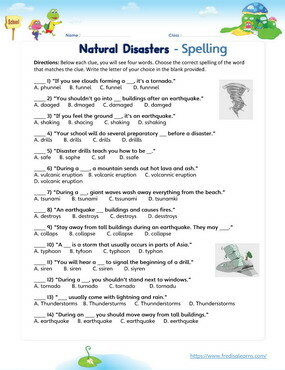 Ms. Ann explores possible scenarios during a tornado and recommended actions for staying safe. The students also want to know why these actions are important. Ms. Ann does the good job of explaining the reasons to the students. You should stay indoors during a tornado. You should get to the corner of room. You shouldn’t go outside during a tornado. You shouldn’t stand near windows during a tornado. Before an earthquake, you should do preparatory drills. During an earthquake, you should move away from tall buildings. After an earthquake, you shouldn’t go into damaged buildings. If there is a tornado, you should hide under a table. If you see clouds forming a funnel, it’s a tornado. If you feel the ground shaking, it’s an earthquake. Why should we put our heads down on our knees? Because if something flies by, it wouldn’t hit your head. Why should we protect our heads? Because your head is the most important part of your body.